Gene expression in specific cells and in specific regions can provide a more precise, neuroprotective approach than traditional treatments for neurological diseases. For multiple sclerosis, specifically, increasing cholesterol synthesis gene expression in astrocytes of the spinal cord can be a pathway to repair nerves that affect walking. Multiple sclerosis is an autoimmune, neurodegenerative disease, characterized by distinct disabilities affecting walking, vision, and cognition, to name a few. MS patients differ markedly from each other regarding which disability affects them the most. Inflammation strips the myelin coating from nerve cell extensions, called axons, and connections at the ends of nerves, called synapses, are lost, together disrupting signaling and eventually causing permanent disability depending on where this occurs. UCLA researchers proposed that molecular mechanisms behind each disability may differ, and that neuroprotective treatments tailored for each disability may be more effective than nonspecific treatments aiming to reduce a composite of different disabilities. 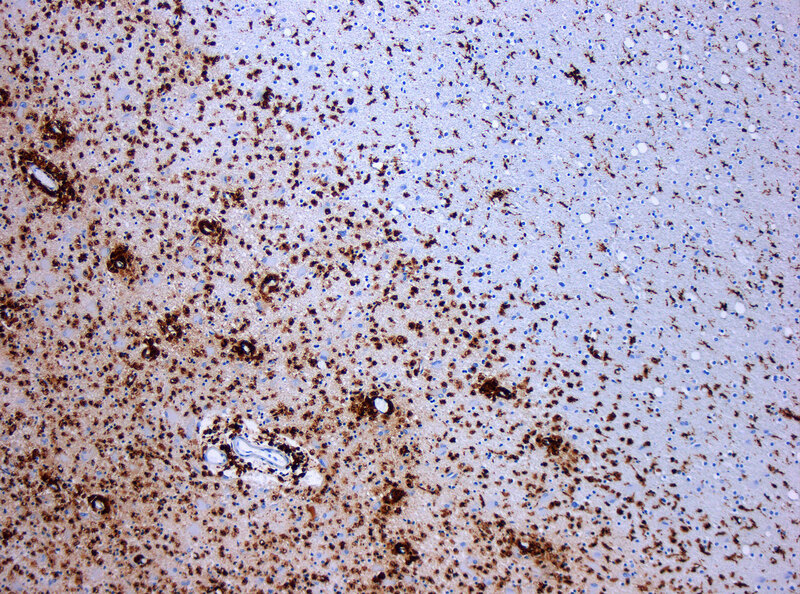 The team focused on astrocytes, a type of brain cell that becomes activated in MS and plays several important roles in disease, examining gene expression in astrocytes in different regions. Working with a mouse model of MS, the research team assessed astrocytes in various regions of the brain and spinal cord known to be involved in walking, vision or cognition. They compared gene expression changes between regions that correspond to different disabilities. In the spinal cord – an area that’s critical for walking — they found a decrease in the expression of cholesterol synthesis genes. Cholesterol does not leave the blood and enter the brain, instead it is made in astrocytes and plays a role in making myelin, the nerve coating, and synapses, the nerve connections. They hypothesized that while inflammation causes loss of myelin and synapses, it is the decrease in cholesterol synthesis gene expression in astrocytes that explains why lesions do not repair in MS. They treated MS mice with a drug that increased expression in cholesterol synthesis genes – and this resulted in improved walking ability. This disability-specific discovery approach represents a strategy for finding neuroprotective treatments for neurodegenerative diseases that are tailored to repair damage for each disability, one at a time, in contrast to a “one size fits all” treatment approach. In addition to senior author Dr. Rhonda Voskuhl, who directs UCLA’s Multiple Sclerosis Program and holds the Jack H. Skirball Chair in Multiple Sclerosis Research, study co-first authors were Noriko Itoh, Yuichiro Itoh, and Alessia Tassoni, with other co-authors including Emily Ren, Max Kaito, Ai Ohno, Vista Farkhondeh, Hadley Johnsonbaugh, Yan Ao, Josh Burda and Michael Sofroniew, all of UCLA. The work was supported with funding from the Conrad N. Hilton Foundation, the National Institutes of Health, the California Community Foundation, the Tom Sherak MS Hope Foundation, the Rhoda Goetz Foundation for Multiple Sclerosis, and other partners of the UCLA Multiple Sclerosis Program. Be the first to comment on "UCLA Researchers Reveal Potential Path to Repair MS-Damaged Nerves"